Epilepsy is a neurological disorder that may affect any age group. It is characterized by a seizure that is a sudden electrical activity of the brain. A seizure may be a loss of completes awareness or uncontrolled movements. There are various causes of epilepsy some of them include brain injury, lack of oxygen to the brain, stroke, high fever or infectious diseases. Those with Alzheimer’s diseases are often a risk of encountering epileptic seizures. The most common method of treatment is adopting a ketogenic diet i.e., a diet low in carbohydrates, and that provides a good source of energy from ketones stored in the body. Anti-epileptic drugs and brain surgery may also be recommended in some severe cases. Research says supplementation of coconut oil in the ketogenic diet can prove to be beneficial in the treatment of symptoms relieving patients with epilepsy. Nature’s richest source of medium chain triglycerides is mother’s milk. Another rich source is the coconut oil. Medium chain triglycerides, unlike long-chain triglycerides, don’t depend upon bile salts for their metabolism. These medium chain triglycerides bypass the bile metabolism and go directly to the liver to get metabolized or in simple words get broken down into ketones. These ketones serve as a fuel to the brain and are a stable source of energy even during periods of low blood sugar without the neurological risks associated with high blood sugar. Let’s discuss how coconut oil can help. Coconut oil can help with epilepsy in several ways. Coconut oil is rich and medium chain fatty acids, which research says can prove helpful in preventing seizures in epilepsy with much lower side effects as compared to prescription drugs. Coconut oil is great anti-inflammatory and thus can help with brain inflammation caused by epileptic seizures. Coconut oil is known to improve general brain health too and prevent gastrointestinal tract from side effects of drugs used in the treatment. Epileptic seizures are abnormal movements or behaviour collectively termed as epilepsy. They may occur in the form of uncontrolled movement or complete loss of awareness. Ketogenic diets are low carbohydrate diets with a good amount of energy and have health benefits too. Ketogenic diets are a popular method of treatment for epilepsy. Coconut oil contains medium chain fatty acids and hence when added to the ketogenic diet that can help control seizures. A study published in Neuropharmacology in 2013 evaluated benefits of medium chain fatty acids in ketogenic diets of children with epilepsy. The study found that diet enriched with medium chain fatty acids was capable of controlling seizures. The diet showed significant potency in epilepsy control with fewer side effects as compared to other commonly used drugs. Researchers of Institute of child health and Great Ormond Street Hospital for Children NHS trust at the University of London conducted a study to assess the results between the epileptic children receiving a ketogenic diet with a control group which was not receiving the diet. 145 children were taken into this study for analysis (between 2-16 years of age). They had frequent seizures (not skipping a day in a week). These children showed no desired response at all to any of the antiepileptic drugs provided and were not treated with a ketogenic diet prior. The children were enrolled in the trial between December 2001 and July 2006. Two hospital centres/ a residential centre (exclusively for young epileptic patients) were assigned to the trail to be conducted. The children were randomly chosen to receive the diet. Some received the diet immediately and some after a 3-month delay. Some children were chosen for the control group also to compare the results in the end. No changes to the treatment were made for the controls. It was not a blind clinical trial. Withdrawals seen earlier were noted and the frequency of seizures in the children was recorded after 3 months (children received the diet for these 3 months). As mentioned before, two groups were made out of the 145 children including the control group with 72 and the test group of 73 children receiving the ketogenic diet. Data analysis was made of 103 children. After the analysis, the results were quite shocking yet expected. Mean % of seizures (baseline): lower in the test group than in the control group. It is believed that the ketones which are produced as a result of the metabolism of medium chain fatty acids present in the coconut oil help in the activation of special proteins that help in the maintenance of brain cells, their repair and growth. Ketones also provide a high-quality source of energy for brain trigger. Coconut oil consumption raises the blood ketone levels to safe therapeutic levels to treat epilepsy. Coconut oil is known to reduce the incidence and intensity of seizures in patients. It is also seen that epileptic patients become seizure free after receiving a ketogenic diet and a reduction in seizure up to 90-99%. A research was done at John Hopkins Hospital, Baltimore, Maryland came up with remarkable results. 150 children were part of their study which was done to assess the efficacy and tolerability of epileptic children towards a ketogenic diet. Out of the 150 children, 20 became seizure free, 21 had a decrease in their seizure rate to 90-99%, 29 became free of medication and 28 were on 1 medication thereafter. Another study by the Department of Pediatrics and Epilepsy Center, Sanggye Paik Hospital, Inje University College of Medicine, Seoul, Korea supports the same. The study involved 14 children with intractable epilepsy who were to receive the ketogenic diet as a treatment. After the study, it was found out that about half of them were seizure free, 1 showed 90 % decrease and 2 patients had a decrease in their seizure rate to about 50% and 90% which was a 50% cure rate and a 71% decrease. Another study published in Iranian Journal of Child Neurology reported that inclusion of medium chain triglycerides is more helpful when added to the ketogenic diet as compared to other fatty acids because it produces energy faster from ketone bodies and is efficiently absorbed in the stomach as compared to long chain triglycerides. Coconut oil is rich and medium chain fatty acids and can be helpful in preventing seizures in epilepsy when introduced in the diet. It has been observed that most medications used in the treatment of epilepsy cause side effects on the gastrointestinal tract. Coconut oil has medium chain fatty acids that can protect the gastrointestinal tract from these side effects. A study published in Biomedical Journal in 2013 used more than 70% medium chain triglycerides in the ketogenic diet to control seizures and side effects in the stomach such as diarrhoea, vomiting, cramps and bloating more effectively than the usual ketogenic diet in children with epilepsy. Researchers suggest the consumption of foods contain medium chain fatty acids for treatment of gastrointestinal related disorders. Its consumption from natural sources like coconut oil can protect the gastrointestinal tract from inflammation, irritation, diarrhoea and electrolyte imbalances. 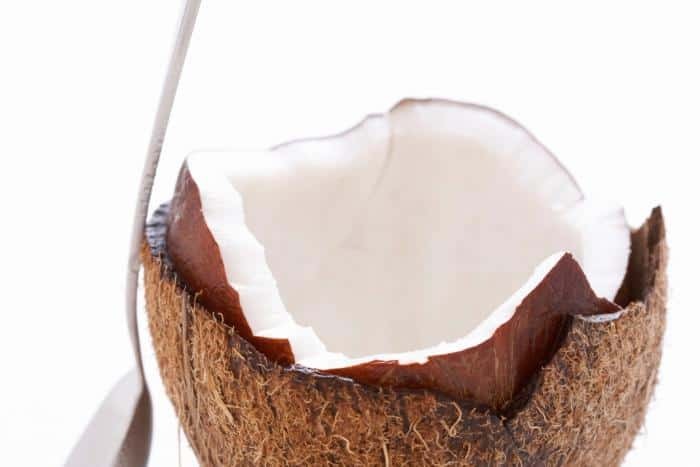 The inclusion of coconut oil in the ketogenic diet of epileptic patients serves as good source of medium chain triglycerides which can protect the gastrointestinal tract from side effects associated with drugs used in the treatment. his property of coconut oil can be used to improve memory and learning ability of epileptic patients. According to a study published in Journal of Alzheimer’s diseases in 2012, extra virgin coconut oil is enriched with antioxidants like polyphenols that prevent oxidative stress by increasing activity of the antioxidant enzyme, glutathione. This prevents accumulation of amyloid proteins and oxidative damage of the brain cells thereby improving memory and learning capacity. Epilepsy is closely associated with brain disease i.e. the Alzheimer’s disease as statistics suggest that those who have Alzheimer’s are at a greater risk of developing epileptic seizures. Another study published in the British Journal of Nutrition in 2015 evaluating benefits of coconut oil in Alzheimer’s disease reported that medium chain fatty acids found in coconut oil is efficiently absorbed and metabolized. It is also converted to ketones rapidly that provide a source of energy that can be beneficial in patients with impaired memory. The polyphenolic compounds found in it prevent aggregation of amyloids and thus brain damage. The study concluded that together these properties could be beneficial in prevention and management of Alzheimer’s disease. Coconut oil is rich in antioxidant that prevents brain damage, improves memory and learning ability. It also provides a good source of energy for repairing memory and phenols reverse brain damage in Alzheimer’s disease preventing the risk of seizures. Seizures are known to result in inflammation of brain cells by up-regulating the production of inflammatory mediators like interleukins. Chronic inflammation of brain cells poses a risk of neuronal cell death. According to an experimental study published in Brain, behaviour, and immunity in 2014, coconut oil that is rich in saturated fats prevents brain inflammation and injuries caused by chronic inflammation of brain cells. A study published by Gasior in 2006 reported that ketogenic diets often contain anti-inflammatory mechanisms that activate certain receptors inhibiting effects of proinflammatory molecules. Anti-inflammatory properties of coconut oil can prevent brain inflammation caused by epileptic seizures. There is no specific dosage of coconut oil for epilepsy. The dosage may differ depending upon the extent of the disease, and thus it must be consulted with the health practitioner especially if you’re on other medications or planning to opt for supplements. Coconut oil with numerous health benefits is harmless and safe only when consumed in safe amounts. 20 grams of MCT is the therapeutic range and 2-4 tablespoons of coconut oil would suffice it. There are certain things to be kept in mind before taking up your dose of coconut oil. Allergic conditions towards the oil must be noted in order to avoid any complication. Pregnant and lactating women must stick to fewer amounts as it is not a condition where you can take risks. Coconut oil has tremendous medicinal properties capable of treating a variety of condition. Researchers suggest its supplementation in patients who have epilepsy. It is safe and effective for consumption and can be used in formulating drugs to cure symptoms associated with epilepsy. Coconut oil possesses the capability to replace drugs used to control epileptic attacks that cause side effects. forgot to mention – I also take vit. B complex; liquid vitamin D so I can put under tongue. I read that defiency of D can cause seizures. And 500 mg magnesium to help me relax 250 mg one in am and pm.